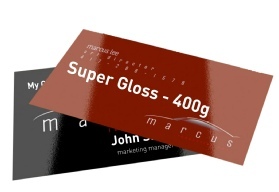 Our Super Gloss business cards are printed on a 450gsm card before having Flood UV coating applied. This is a gloss varnish over the whole card which is dried instantly under Ultra Violet light producing a super high gloss smooth feel which is extremely hard wearing. Our digitally printed business cards are designed to be cost effective for smaller quantities. They are digitally printed on a premium silk 350gsm card. 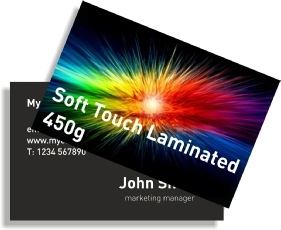 This makes a quality hard wearing every day business card that is produced very quickly. These cards are also ideal for appointments cards as they can be easily written on. Next day collection for urgent orders. Delivered to one UK address from completion. Need them urgently... Please call or email. 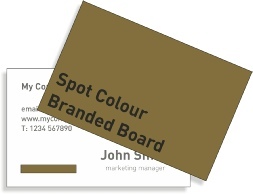 Our natural business cards are printed on a uncoated 400gsm white board. 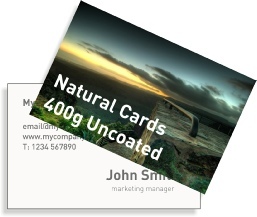 They have a slight rough texture and the final print has a duller appearance when compared to our silk coated cards. They are perfect for appointments cards as they can be easily written on.  possible to recreate correctly in 4 colour process colours. They are printed on a choice of standard or branded quality boards. All spot colour printing will require a bespoke quotation, so just email your requirements and we shall get back to you with our best prices. Paper samples and Pantone colour swatches are available to view on request. 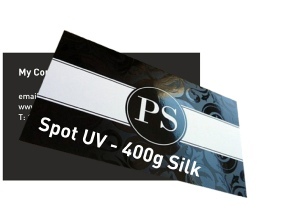 See here for more information on Spot colour printing. Printed single or double sided using the full Pantone colour range. Large choice of quality branded boards. Our Hot Foil Business cards have a beautiful metallic finish. The metallic shine makes them look and feel extra special. 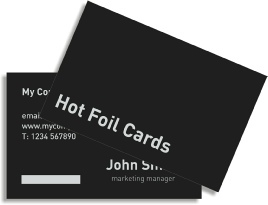 These cards can be printed and Hot Foiled or just Hot Foiled. Please email all your requirements for the latest prices and options available. Foiled single or double sided. Delivered to one UK address in approximately 8/10 working days. This produces a truly luxurious extra thick card which is extremely hard wearing. 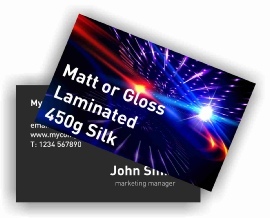 Our laminated business cards are printed on a 450gsm silk card before having a matt or gloss laminate covering applied. This is a very thin plastic coating which give your cards a silky smooth or glossy professional finish. It also makes them extremely hard wearing.